The seventh largest cryptocurrency by market capitalization is battling to stay above the $30.00 supportive level which was dealt with for the last time almost two years ago mid-2017. The pair LTC/USD is changing hands at $33.10 with 4.56% increase in the last 24-hours leading the BTC market by 3.66%. The silver coin to Bitcoin’s gold is standing at a market cap of $1.994 billion closing in to the big $2 bln. 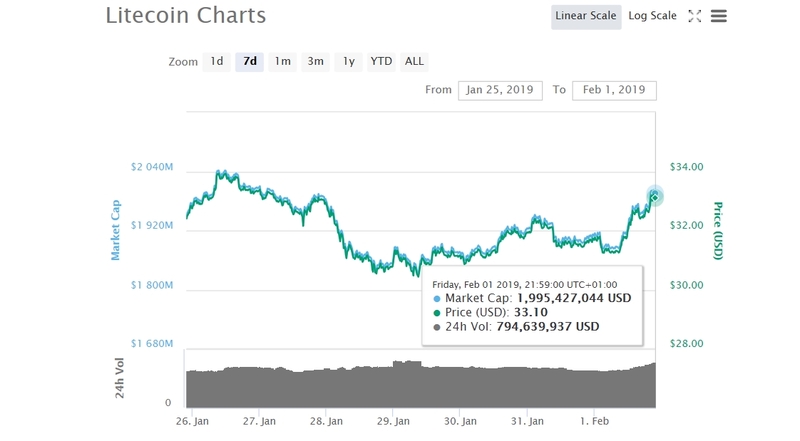 The latest performance has differentiated Charlie Lee’s coin-standing even further away form Tron’s $1.755 market cap. Believing that the scaling debate is behind the scene right now, Litecoin founder Charlie Lee highlights via his official twitter handle that the main focus now is making the coin more fungible meaning to up-grinding the ability to interchange with other goods or assets of the same type.